Let’s face it – homelessness is a problem in the United States. No matter what reports may claim homelessness is an ever-increasing problem that politicians and leaders in the United States have failed to tackle effectively. While every state has programs, there are still people hurting and suffering in one way, shape, or form. One organization making a huge impact in fighting homelessness is The Helping Lunch Box Project (THLBP) founded by two brothers, Kyllon and Derrell Martin Jr. 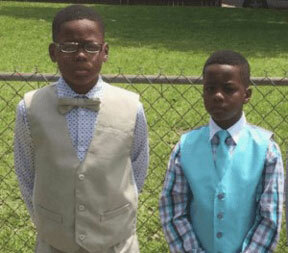 These brothers, ages nine and 10 have been making bag lunches for the homeless in New Orleans, La. Their goal is to end hunger in their city. Before Hurricane Katrina devastated New Orleans, it was estimated that there were 6,000 homeless people in the area. However, after the catastrophe, that number swelled. The Martins were one of the many families affected by the Category 5 storm. They re-settled back to New Orleans in 2010 after being displaced to Alabama in 2006. Once back, the brothers wanted to do something to help people who were without food. They began preparing bag lunches. On a couple of their outings, they went to a local bridge called the Crescent City Connection and met with groups of people under the bridge. Word began spreading and many people were donating to this effort. Because of their passion and commitment to ending homelessness, THLBP was featured on WDSU on June 13. In addition to that, their profile made its way to Now This News which has since gone viral. Still gaining the attention of so many people, they have now partnered with the New Orleans based non-profit B.O.S.S. Youth Outreach Program.